Arlington is a fine example of Greek Revival architecture dating from the 1840s. Originally called “The Grove” the house was built by Judge William S. Mudd, one of the ten founders of Birmingham, and is the only remaining antebellum mansion remaining in Birmingham. Shortly before the end of the Civil War, General James Wilson arrived with over 13, 000 troops and using Arlington as his headquarters, planned the destruction of the Confederate iron furnaces and the military school at the University of Alabama in Tuscaloosa. The property went through several owners and in 1902 became the home of Robert S. Munger. Over the next twenty years he did many renovations including plumbing and electric lights. He had another structure moved across the street behind the main house which was used for a kitchen, dining room, sun parlor and sleeping quarters. Mr. Munger also had one of the first “motor cars” in Birmingham. 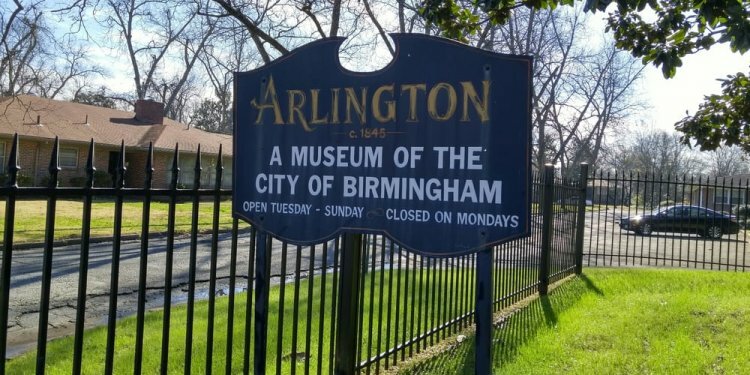 Located on six acres in the heart of Old Elyton, the first permanent County Seat of Jefferson County, Arlington is a center for historical, cultural, and civic activities. Special rates available for groups. Arlington has a restored garden room available for private and club rental. The facility is available for weddings, receptions, breakfasts, luncheons, and dinners. All events are scheduled by reservation only. Arlington is a venue where traditions from around the world can freely harmonize with golden days of past elegance. We are the last Antebellum home in Birmingham and would provide a unique backdrop to such a special occasion. Second Thursday Luncheon, Thursday, April 10, 2014 seatings 11:30 and 1:00 Reservations required. Mother’s Day Brunch, Sunday, May11, 2014 1:00 seating. Thursday at Arlington, Every Thursday in June, July and August (except July 3rd) seatings 11:30 and 1:00 Reservations required. Second Thursday Luncheon, Thursday, September 11, 2014 Reservations required. Second Thursday Luncheon, Thursday, October 16, 2014 Reservations required.Second Thursday Luncheon, Thursday, November 13, 2014. Reservations required. Christmas Open House, Saturday, December 6th 10:00 till 4:00 and Sunday, December 7th 1:00 till 4:00 Free to the public.